Meet Robert H., uber-geek and living tribute to two of my favorite geek icons, Batman and Buffy the Vampire Slayer. Robert dropped me a note after my post in December profiling portrait tattoo super-artist Nikko Hurtado. Turns out that several of the stunning tattoos that I highlighted in that post decorate Robert’s appendages. I think we just had a lot in common, so he was always excited to do the pieces that I wanted. Robert has been “huge into Batman” since he saw the original Tim Burton Batman movie when he was twelve. The movie even inspired a continuing, 18-year streak of comic book collecting (including every issue of Uncanny X-Men since 1988). 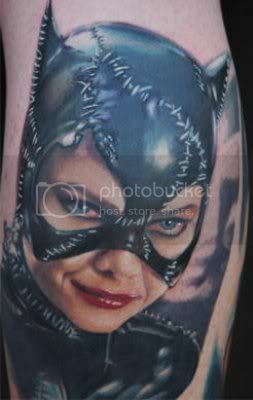 So, when Nikko was looking for inspiration for a “cool” tattoo to submit to a contest, Robert produced an image from a Batman Returns book. 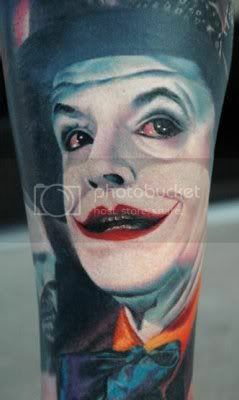 The subsequent Batman tattoo that Nikko created on Robert’s leg was Nikko’s first color portrait; now Nikko is world-renowned in tattooing circles for those portraits. Robert has seven tattoos, all done by Nikko. Following Batman came the Joker, Catwoman, and Peguin. Even more than Buffy or Batman, however, Robert is big-time into Star Wars. He plans for some Star Wars tats “somewhere down the line,” and lives in a two-bedroom apartment just to accommodate his collection of Star Wars memorabilia. Not to start a nerd-fight with the toy collectors among you, but he claims the collection “blows people away.” His favorite piece? A working replica lightsaber. Thanks to Robert for sharing the pics and your story. I hope you’ll keep us updated as the “Buffy leg” develops. In the meantime, readers, you can check out more of Nikko’s work on his MySpace page. 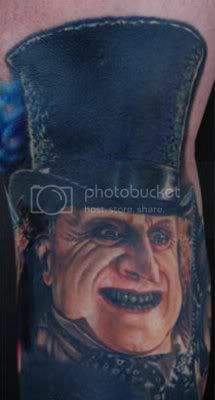 Want to see more Batman tattoos and other geeky curiosities? Subscribe to Great White Snark by email or by RSS. It’s free. That’s a lot of ink to get down without any Star Wars real estate for someone so into Star Wars. Next post: Reader Poll – Which freshman TV show would you most like to see cancelled?